It was an amazing duel in the final seconds between two of the most promising European prospects in the league today. Luka Doncic is no stranger to do-or-die moments. Ever since he arrived to the NBA, the Mavericks have leaned on him to deliver in the clutch. And he has. Doncic has had some iconic moments in just his first year in the league. Against the Nuggets, it was no different. With 10 seconds left on the clock and Dallas down by one, the Mavericks went straight to their wunderkind. Doncic was isolated at the top of the key. There was a break down on the defense and Harris had to rush and switch to the right wing, leaving Mason Plumlee to defend Doncic. Doncic found the opening he needed and attacked head on leaving Plumlee in the dust. He slammed home a one-handed hammer over Plumlee and Paul Millsap as he was fouled. That gave the Mavericks the lead with less than six seconds left on the clock. Unfortunately, Doncic missed the bonus leaving the door open for Denver to steal the win against Dallas. Nikola Jokic is also a European wonder. His passing and court vision is out of this world. He’s the best passing big man in the league today. But, while his passing makes the highlight reels, his scoring can somehow be forgotten. Today, he reminded everyone of just how dangerous a scorer he can be. With less than five seconds left, the Nuggets ran a play not for Harris or Millsap or Jamal Murray or Will Barton. They went straight to Jokic. He got the ball in the left wing and dribbled straight to the paint. Jokic faked a spin to the left and then pivoted back, bodying Dwight Powell. That gave him the slight opening he needed to launch a floater that splashed in at the buzzer. 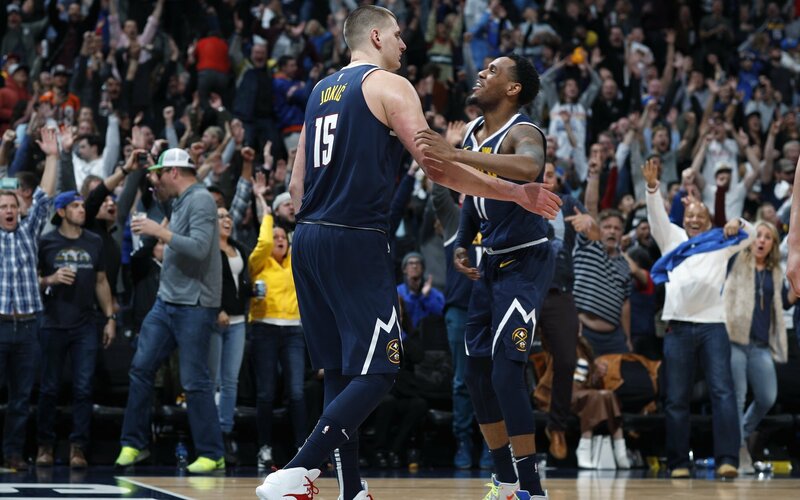 It wasn’t Jokic’s best scoring game. He finished with only 11 points on 4/9 shooting. But he still rounded out his statline with 14 rebounds and eight assists. On the other end of the court, Doncic flirted with a triple-double. He had 24 points, 11 rebounds and nine assists. The Nuggets were able to rebuild quickly because they had a generational talent like Jokic to build around. The Mavericks are in a good spot too. Not only do they have a similar generational talent, Doncic hates losing. When Victor Oladipo went down down with an injury last January, everyone thought that the Pacers would slowly fall out of the Playoff picture in the East. But that wasn’t the case. Indiana continued to get production from everyone on the roster and the Pacers fought hard for every win. One of the players that has been helping the players as of late has been buyout signing Wes Matthews. He was signed by the Pacers to fill in the vacant shooting guard slot. He brings a similar defensive skillset as Oladipo and additional shooting to spread the floor. Today against the Thunder, Matthews delivered a win. He scored on a put back with less than two seconds left on the clock to give the Pacers a crucial win. The Pacers are holding steady with the third best record in the league. The win puts Indiana to 1.5 games above the Sixers in the East. When the Celtics travelled to Sacramento last week, Kyrie Irving didn’t suit up. He made sure to make up for missing that game with a monster performance today. Irving dropped 31 points, 10 rebounds and 12 assists on the visiting Kings. The Celtics continue their winning ways. They’ve won four of their last five games and are making up ground on the fourth-seeded Sixers.